Kampala, the capital of Uganda, lies close to the northern shore of Lake Victoria. The war graves plot is all that is now left of what was once a large African burial ground, now given over to growing bananas and cassava. The cemetery will be found on the Old Port Bell Road, which runs west from the city centre, about 8 kilomentres out of town close to the large Uganda Coffee Board building. The war graves plot is set about 300 metres back from the road up a rough track that was once the main drive of the civil cemetery. The track is opposite the Shell petrol station and a direction sign has been provided to indicate the turning. Kampala (Nakawa Road) Cemetery is open Monday-Friday 06:00-18:00. Outside these hours the cemetery is locked with a coded padlock. If you intend to visit outside of the opening hours the code to the padlock can be obtained from our office in Kenya on 00 254 20260 4301. The opening hours of this office are Monday-Friday 08:30-12:30, 13:30-16:30 (closed weekends). 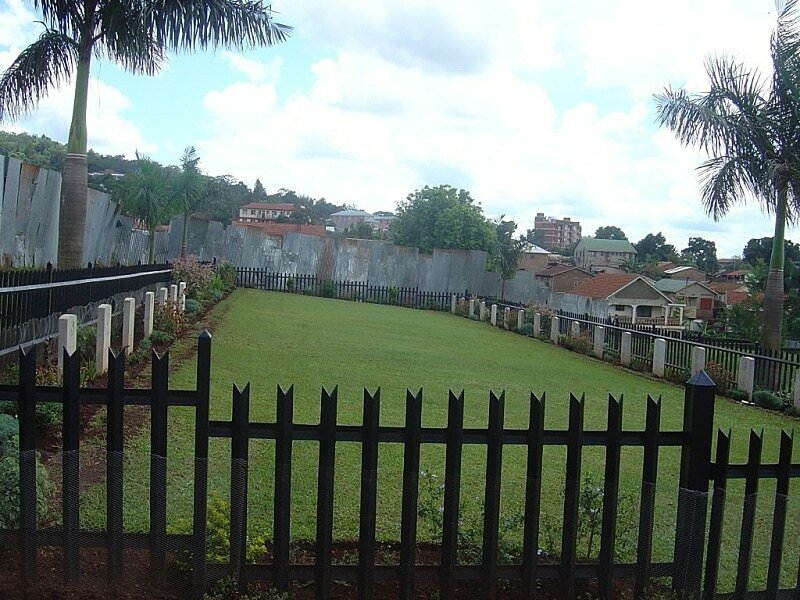 Kampala (Nakawa Road) Cemetery contains 26 Commonwealth burials of the Second World War, the total made up of 19 soldiers of the East African Forces and seven men belonging to the Uganda Police. One First World War casualty is commemorated here by special memorial, and the Commission also cares for one Belgian war grave in the cemetery.